The sketch at Happy Little Stampers is very Mondrian-esque and I love it, however I thought that I would go off on a tangent a little and begin with an octagon. I stamped and coloured the Penny Black image, before die-cutting it with a Spellbinder die and then slicing it into pieces, horizontally and vertically with two cuts in each plane. The sentiment is from Hero Arts. This one is for the challenge at Just Us Girls, where the theme is Balloons! This little teddy only has one, but maybe that's enough. Sizzix die for the teddy and I think a Memory Box balloon! this is the most fantastic interpretation of the challenge sketch - absolutely wonderful and so creative - looks like a winner to me!! I definitely think one balloon is enough for the challenge-and a cute, pink, heart balloon? Well, that's just perfect! What a fun and clever take on the sketch at happy Little Stampers! Thanks for joining us this month! Two beautiful cards! 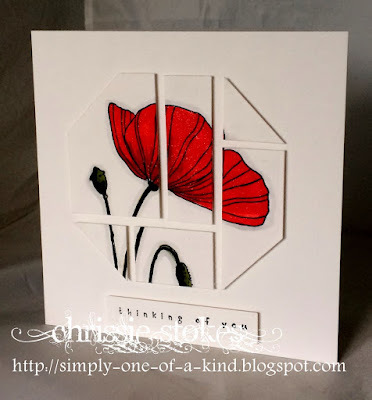 It must have been difficult making that first cut on that beautifully colored poppy image. The results are well worth the risk, as it is truly stunning! Thanks so much for joining the Happy Little Stampers September Sketch Challenge. The octagon frame looks oriental traditional window.